Jordan Eberle will forever be remembered in Canadian hockey lore for his massive game tying goal in the World Junior Hockey Championships against Russia in 2009. With less than 10 seconds to go, Eberle scored one of the most memorable goals in WJC history. Canada won the game 6-5 and would go on to win the Gold medal against Sweden. Eberle’s clutch play continued the following year against the USA, scoring two goals late in the third period, including the tying goal that would send the game to overtime. Because the Edmonton Oilers didn’t make the playoffs this season, Eberle accepted an invitation to play for Canada at the IIHF World Hockey Championships, and so far, he hasn’t disappointed. He scored the tying goal in a pre-tournament game that Canada would eventually win in a shoot-out. He has 3 goals and 4 points in 4 games, his best performance coming yesterday against Switzerland. With Canada down 1-0, Eberle set up New York Islanders forward John Tavares to tie the game, and then would score a goal of his own to put Canada up 2-1. He won the player of the game, as Canada would go on to win 3-2. Eberle’s name is being mentioned among the possible candidates to play for team Canada in the 2014 Olympic games, and rightly so. 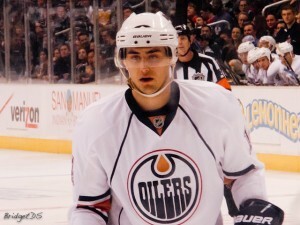 Eberle had a break-out season with the Oilers this year, notching 76 points in 78 games, and is continuing his high level play while representing his country. Eberle is joined by two Oilers teammates, Ryan Nugent-Hopkins and goalie Devan Dubnyk. Nugent-Hopkins has 2 goals and an assist so far, while Dubnyk was in net for Canada’s 7-2 win over France. Canada has three more games in the preliminary round, and has a record of 3-1 so far. Look for more brilliance from Jordan Eberle as the tournament goes on. He just seems built for the world stage.